Our crafty selves will thank us for any cute easy projects. Coasters are easy and quintessential “Must Do” of all time. Cheryl explains all about making coasters with patch work on zitzmanfam.blogspot.com.This requires a basic sewing skill and can be whipped out in an hour. For six coasters you would need 12 fabric pieces of 4.5 inches each.whether you want a monotone or multi hues you can choose any colour of your choice to match or can pick bold prints and patterns.Fusible batting is needed for these coasters alternatively you can also skip using it. 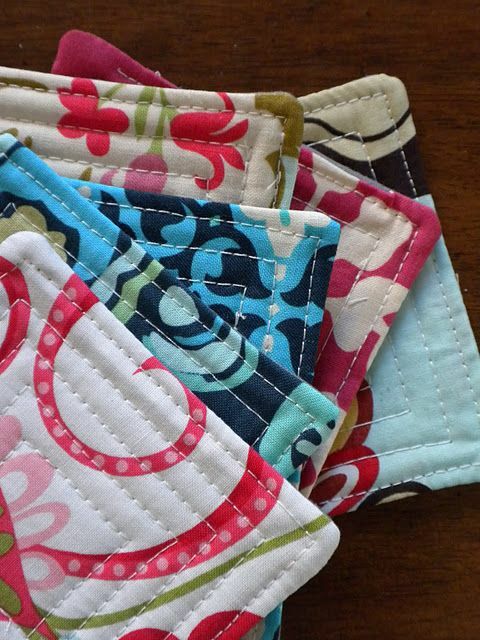 These easy quilted coasters can make wonderful keepsakes.Find cheryl’s tutorial HERE.